During the first week of this month, a team of seven from Trinity Church traveled to The Joy Center in Big Creek, Kentucky. We went there expecting to stay in the dormitory there, but due to some unexpected plumbing problems, we stayed at the parsonage instead. While we were there, Pastor Becky stayed in her husband’s (he is also a pastor) parsonage a half-hour away. We really didn’t know what to expect when we got there. 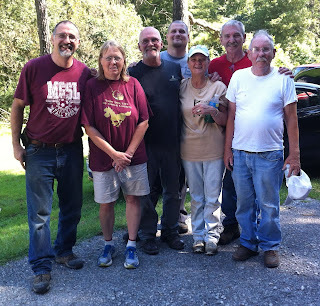 Most of us had never set foot on The Joy Center and even though Patti had been there before, she had never been with a group that had a work project like ours. But every day was little short of amazing and miraculous. We were welcomed with open arms by Pastor Becky and Nancy (who volunteers there full-time in lives in a basement apartment in the parsonage) and everyone else we met. Our original plan was to renovate two rooms for Mitchell, an elderly blind man, who lived a short distance away but that plan changed even before we left. Apparently, the person who originally estimated the cost of the project was inexperienced, and missed the mark by a considerable margin. First, the cost of materials was much greater than estimated so we probably couldn’t afford to do both rooms, and second, the second room would require far more time than we had available. And so, the next day we set to work tearing apart Mitchell’s bathroom. At least some of us did. If you were here at Trinity when I was inviting folk to go with us, you might remember that I said the folks at The Joy Center would find something for everyone to do regardless of your age or skills. While Jan and Wade Gash, Ernie Ball, Patti Partridge, Warren, Kevin and I went to Mitchell’s house to work, Sue Neddy-Scopelite, Marilyn Ball, Nancy, and Pastor Becky worked on something else back at The Joy Center. While we hammered nails and ripped up floors, the others cut coupons, cleaned, painted, and helped with the free lunch that The Joy Center prepares and delivers every Tuesday. You might have noticed that Warren and Kevin were names that were unfamiliar to you, and you would be right. These men were not from Trinity, but were on our team just the same. Warren is a retired gentleman with some construction experience from Atlanta, Georgia who volunteers on projects like ours at Red Bird for several weeks every year and Kevin attends church at The Joy Center. Each day we worked until dinner time, and then returned to the parsonage for dinner and conversation about what everyone had seen and done that day. After dinner, we often found other things that needed to be done or repaired at Pastor Becky’s parsonage or at The Joy Center. Since the only “staff” there is Pastor Becky and Nancy, literally everything is their responsibility. That meant that any little thing we could do for them saved them precious time to do other things. We sorted beans for bean soup (sometimes sacks of beans have pebbles mixed in with them), mopped, dusted, vacuumed, mowed grass, weeded, put up shelves, installed lights, repaired things, installed a sliding board on the playground, moved boxes, replaces screens, and anything else that we could find to help out. We finished Mitchell’s bathroom Wednesday afternoon but still found things to do at the Joy Center for the rest of our time there. On Thursday we travelled to the Red Bird Mission and toured the medical clinic, food pantry, clothing store, craft store, the Red Bird School, the Red Bird Conference offices, and several other things. It is impossible for me to describe all the things that happened that week in this short space, but Trinity should certainly be proud of our team and the work that was done in Big Creek, Kentucky. You should be proud of the effort that it took by the entire congregation to send and support our team. We saw much, learned much, blessed many, built new friendships, and were blessed beyond measure ourselves. I hope that you were able to come and hear Pastor Becky when she spoke at Trinity this month or have been able to see our pictures, or have been able to talk to some of our team members. Everyone was so excited that they were all talking about going back before we had even started for home and we are already, tentatively, planning another trip next Spring. And just in case you were worried that going on a mission trip meant that you would have to preach or something, not one of us had to get in front of a group of people. Our entire witness on this trip was all about being a servant and doing things for others as we were able. There is a famous quote that sums up much of what “missions” really means.